PLUS … Win Tickets to see the show in Sydney! Nathan Pinnell is currently the Dance Captain & Swing in the Australian production of Singin’ In The Rain which soon leaves Melbourne to open in Sydney on 7th July. He talks to DanceLife about the roles of Dance Captain & Swing in musical theatre productions today. Nathan is an award-winning performer with a career spanning well over a decade. Nathan’s professional career began at the age of 9 in two Opera Australia productions. His continued his work as a model and dancer eventually led him to the theatre. Nathan’s theatre credits include Baz Luhrmann’s Strictly Ballroom: The Musical, Legally Blonde, West Side Story, Chicago (for which he received a Green Room Award), Dusty: The Original Pop Diva, We Will Rock You, Chitty Chitty Bang Bang, and High School Musical. He received Best Supporting Actor for the Theatre People Pro Choice Awards 2013 for his role in Gypsy for the Production Company. Nathan was also Assistant Choreographer for Caroline O’Connor and Strictly Sydney Mardi Gras Finale Float 2014. More recently Nathan was Dance Captain on Opera Australia’s Anything Goes and Hugh Jackman’s Broadway to Oz arena tour. DanceLife had the pleasure of speaking with Nathan Pinnell during rehearsals for the premiere of Singin’ In The Rain in Melbourne in May. WIN TICKETS TO SINGIN IN THE RAIN … SEE BELOW!! Q: So how did you end up as a successful musical theatre performer? A: My grandmother and mother were both dancers so I got thrown into it at age two. They were from the classical ballet world but because of them I learned all genres of dance to be an all-rounder. Then I went to Bev Palmer Performing Arts in Victoria until I was about 16, and then I went straight onto do professional musicals. I also studied at the Victorian College of the Arts from years 8 – 10, but got work in production musicals so I didn’t end up completing Yr12. I consider myself a music theatre performer now, even though I started out in dance. Q: How did the role in Singin’ in the Rain (SITR) come about? What does it mean to be a Dance Captain and a Swing? I auditioned for the show and was successful to get the role as Dance Captain with SITR. I’ve done that role before and had just come off working on the Hugh Jackman Broadway to Oz tour. Working with Hugh was amazing … Hugh is everything and more! He’s the hardest working man I’ve ever met! I was also Dance Captain and Swing on Anything Goes last year – working closely with the choreographer Andrew Hallsworth – and have been assistant choreographer for Caroline O’Connor before. Rehearsals for Singin’ in the Rain began in March with some of the leads and dance captains for sort of a ‘boot camp’ to get down some of the main choreography; The rest of the cast came in the week after. I’m also a swing in SITR which means I cover all of the ensemble and some of the smaller character parts. The choreography for this show is by Andrew Wright from the London production, and we had his associate, Jaye Elster, who was the Dance Captain on the West End production of SITR, come out to work on the Australian production and teach us all the choreography. My job as a Dance Captain is to make sure her work is carried on for the rest of the show. Q: What does Singin’ In The Rain mean to you? SITR is the epitome of musicals so it is such a thrill to be working on it! My first memory of the movie is, of course, Gene Kelly … he is so special in that film. But the best memory I have is the ballet scene with Gene and Cyd Charisse … that was magical when I was a kid. Q: How faithful is this production to the original movie? Our production completely captures the heart and soul of the original movie, but it has all new choreography. Certain things are retained for authenticity, like Cosmo’s dance to Make Em Laugh where he runs through the wall … he has to do that! And the 3 leads walking over the sofa in Good Morning is like in the film … So the iconic elements from the film are definitely included. The one thing we have been sure about during the rehearsals is to stay true to the period and feel of the original movie. We are really trying to produce a stage show that is as good as the original movie – just in a modern way. Q: Can you please explain the roles of Dance Captain & Swing? What are the positives and negatives of these roles in a show? The role of the Dance Captain is to keep the show exactly how the choreographer intended it to be. So my job is to maintain the show in the same order, style and theme that the choreographer wanted. This means giving notes, making sure everyone is happy, and managing people and personalities in the ensemble. Being a Swing simply means going on stage and performing the role of the person you are covering every performance. You ‘swing’ from one role to another. This means, a swing has to remember a lot of different routines, staging and roles all at the same time. Swing is not a role for everybody; some people don’t have the ability to instantly remember diverse and numerous choreography at the drop of a hat. A swing can get thrown onto the stage in a different role half-way through a show and you have to be prepared and able to do that at a moment’s notice. You have to always be on your toes, and I love that! I never know what I am going to get when I go into work each show day. Not every performer wants to, or needs to be a swing. The best part of ‘swinging’ is that I get to play everyone’s part in the show. I can get to go on for anybody and that can happen on any given day. If I were in the ensemble I would have to do the same plot for 8 shows a week for a year. Swing gets the luxury of the excitement of doing it all. As Dance Captain, it’s a real pleasure to know I come to work and get to pay homage to another person’s choreography and keep it in check. It’s working side by side with the choreographer, behind the scenes, hearing what they have to say, and watching how their process works is amazing. As Dance Captain, managing the dancers and cast is such a hard task sometimes. There are days when you walk in, give someone a note for a show and they may take it the wrong way depending on how I say or deliver it. My direction can be totally misconstrued, and they’ll get upset, but the way a DC handles this with each individual is an interesting job. With each DC job I’ve had I have learned lessons about how to handle conflict better and manage individuals better. And the more you do it, the better you get at it being DC. On SITR as Dance Captain I work with all the cast – ensemble and all the leads – Adam Garcia, Gretel Scarlett, Erica Heynatz, Jack Chambers – in making sure their work is kept tight and fresh each night. The leads in SITR have been wonderful to work with as they are so keen to take notes and learn even though some of them are very experienced and well-trained dancers. Q: What are your future career goals? My ultimate goal is to – one day – do full choreography, and having a residency would be great too one day. At present I’m working towards those steps and will have to see what the outcome is in the future. But right now I am really enjoying where I am at in my career … it’s a journey but you’ve got to enjoy the process along the way. Q: Where is Musical Theatre positioned right now in Australia? It’s really popular here at the moment, but I think the growth of Musical Theatre in Australia and its success has been gradual over the past ten years due to new works being created – such as Baz Luhrman’s original production of Strictly Ballroom for the stage – which we never thought would have happened ten years ago! I think now it’s really trending in Australia because we have a huge amount of talent and many international creatives have come over here, worked with Australians and thought ‘Geez – they’re good!’ This attention has pushed the industry here. So now we have all these new companies and theatres popping up providing different elements of live theatre we can enjoy in addition to a main stage production. Q: Are we producing too many qualified and talented performers to sustain work here? Do they still need to work overseas? Well that’s what I did! I went to London and worked in the West End. I think it comes to a point where there are so many music theatre and dance courses now that it is perhaps over-churning the talent. But people have to remember that in this industry you are always lucky to be in work. And if you are talented, work hard at your job and remain a good person, then people are going to want to work with you no matter what! And working overseas is important; it’s a rite of passage as an Aussie. Working in the West End really made me aware of the realities of this industry but it made me realise Australians are so worthy – were just as good and deserve to be there on the stage whether it be London, New York or Melbourne. Q: Finally, why should people come and see SITR? And are there any surprises? It’s classic Musical Theatre! 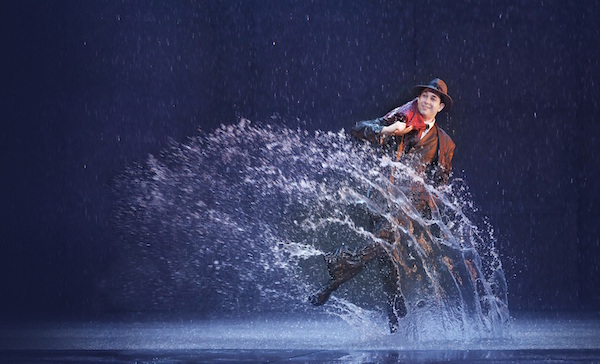 And if you want true Hollywood singing, dancing and storytelling it doesn’t get much better than Singin’ In The Rain. This is it! Plus, it actually rains on stage!! You are probably never going to see that again. Adam Garcia gets wet, the audience gets wet and then the entire cast gets wet! The main surprise working on this production is seeing it come to life on stage – in ‘the flesh’ – as the only other version we have in our memories is in a filmic one from the movie. Of course, the splash zone in the move with real water is a very exciting surprise as well. 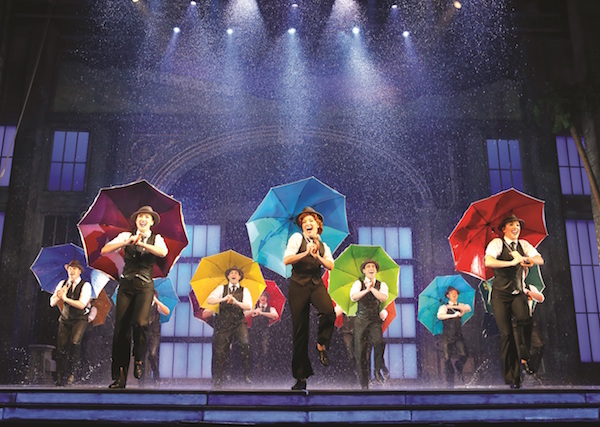 We have a double pass to give away to SINGIN IN THE RAIN on Friday 8th July, 8pm, at the Lyric Theatre Sydney. Worth $240!! To enter simply send an email with the subject line ‘Singin in the Rain Sydney’ to win@dancelife.com.au with your name, phone number and postal address. A winner will be chosen at random. Entries close on 1st July. Previous Post Cinderella Family Panto | WIN TIX!